Regulations concerning the testing of ring slings and wraps became mandatory January 30, 2018. Here's what that means for small businesses like mine. All wraps and ring slings must pass testing using the manufacturer's directions before they can be sold. The testing is looking to make sure that the fabrics used are safe, and that the carrier can be used safely as it is designed. The standard specifies that testing must be redone whenever there is a "material change" in the design, or annually, whichever comes first. As an example, if I make a WCRS out of a Didymos wrap, it may not perform the same as a WCRS made from a Girasol wrap, because the two wraps are from different manufacturers, and I would need to sew and test both. Each testing cycle (which must be repeated annually) costs more than $500 per item. It simply isn't possible for me to test a sling from every wrap manufacturer. In fact, I need to sew a minimum of 25 slings from a given manufacturer just to break even on testing costs, and as a business owner, I need to take care of my bottom line and make sure I'm not just breaking even, but making a profit to provide for my family. These factors add up to the sad reality that custom WCRS are just not practical anymore without cooperation between the converter and the wrap manufacturer. I have completed testing on instock French twill, linen, water mesh, and my Tekhni Bios exclusive. Because of the latter, I can still convert new Tekhni Repreve-blend wraps. I have also worked with Meeyoo on doing WCRS with Girasol standard-weight broken twill weave wraps (not the thick twill or diamond weaves), with a gathered shoulder, so they're okay, too (but only with the gathered shoulder). These are the only non-instock WCRS I can legally continue to sew. The slings in my Clearance section were sewn before the deadline, so they are exempt from testing (the standard applies to slings sewn after the January 30th commencement of the regulation). I will not be able to do conversions on anything I haven't tested, and anything used is also a no-go. This means: no wraps other than those listed above; shoulder redos even on brand-new slings (since I won't have tested the fabric from that manufacturer, unless it's a Tekhni Repreve or Girasol WCRS); and other customer-sent fabrics, such as silk or handwoven pieces. Some people who sew carriers are under the impression that your business has to be a certain size for the regulations to apply to them. That is not true. The regulations apply to anyone who accepts money to sew a carrier -- that's what defines a manufacturer. Whether you make 5000 slings a month or 5, when someone pays you to do it, you're a manufacturer, and your carriers are legally required to comply with the regulations. That's not just testing; it's also the rules that went into effect in 2011 for labeling and tracking. You can read more about those on the BCIA's website, and I recommend contacting them for compliance help if you're just starting out. If you're already making non-compliant carriers, you need to stop ASAP until you're in compliance. Continuing to sell puts you in very real legal jeopardy. It's tempting to assume you will just slip under the radar if you're small enough, but that hasn't been the case in the past, and is unlikely to work for you in the future, either. This is not something you can ignore. 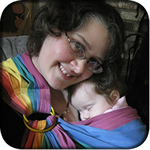 I am a member of the BCIA, the Baby Carrier Industry Alliance. (Actually I was a founding board member, but now I'm just a regular member.) The BCIA is essentially an industry club. While there are BCIA members who volunteer to work with the CPSC (Consumer Product Safety Commission) on the ASTM (American Society of Testing and Materials, though now they just use ASTM because it's international) sling standard, the BCIA does not set or have other undue influence on the standard's creation. They help members reach compliance with the standards and the CPSIA (above), but there is no "BCIA certification" or "BCIA compliance". Either a business complies with the standards and rules or they don't; the BCIA doesn't judge that or certify its members. The phrase "BCIA Compliant" in a seller's listing is a huge red flag that they are probably not following the rules, since they either don't understand or are ignorant of what they actually need to do to comply.